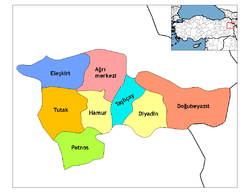 Ağrı, formerly known as Karaköse from the early Turkish republican period until 1946, and before that as Karakilisa (also rendered as Karakilise) (Ottoman: قره‌کلیسا), is the capital of Ağrı Province at the eastern end of Turkey, near the border with Iran. In the medieval period, the district's administrative centre was located at Alashkert, once an important town. The "kara kilise" that gave the town its name was a medieval Armenian church. In 1895 Lynch stayed in Karakilise and wrote that it had between 1500-2000 inhabitants, was nearly two-thirds Armenian, and that a barracks for a locally-recruited Kurdish Hamidiyeh regiment had been recently located in the town. Ağrı has a warm-dry summer continental climate (Dsb) under Köppen and a warm summer continental climate (Dcb) Trewartha classification. Summers are generally brief but warm with cool nights. The average high temperature in August is roughly 30 °C (86 °F). Winters are very cold. The average low January temperature is −16 °C (3 °F). However, temperatures usually plummet to −40 °C (−40.0 °F) during the winter months. It snows a lot in winter, staying for an average of four months in the city. The highest recorded temperature was 39.9 °C (103.8 °F) on 10 August 1961. The lowest recorded temperature in Ağrı was −45.6 °C (−50.1 °F) on 20 January 1972. ↑ H. F. B. Lynch, "Armenia, Travels and Studies, volume 2, pages 3 - 9. ↑ Ağrı sosyal yaşam Archived January 19, 2013, at the Wayback Machine.